Ado-Ekiti—The gale of protests in Ekiti State following the Economic and Financial Crimes Commission, EFCC, revelation of the involvement of Governor Ayo Fayose in the arm scandal has not shown any sign of ending yet, as the state chapter of the All Progressives Congress, Conference of Nigerian Political Parties, CNPP, and other anti-Fayose groups, yesterday trooped to the streets of Ado Ekiti in protest against alleged looting of the state by the governor. The Coalition commended EFCC for freezing the governor’s accounts in a new generation bank for allegedly containing N1.3 billion from the office of the former National Security Adviser, NSA, Col. Sambo Dasuki, (retd) to fund the governor’s campaign in 2014. Security agencies, comprising of the police and operatives of Department of State Services were deployed to provide cover for the mammoth crowd that attended the rally. The protesters comprised party leaders, students, youth groups, artisans and other like-minded individuals who marched from Fajuyi Park through Okeyinmi to Ijigbo area where they were addressed by their leaders. Unanimously, the protesters passed a confidence vote in the leadership of President Muhammadu Buhari and his anti-corruption war, challenging the EFCC to dig deep into the finances of the state and prosecute whoever was indicted in the looting of the state’s treasury. They chanted anti-Fayose’s songs and displayed placards of various inscriptions to deride the way the governor had allegedly been looting the state, especially his alleged indictment in the arms fund, alleged collection of kickbacks from contractors handling various projects in the state to buy multibillion naira property in Lagos , among others. 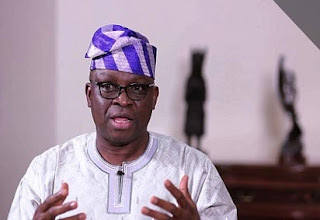 The APC Acting Chairman in the state, Mrs Kemi Olaleye, lamented how the immunity conferred on Governor Fayose in accordance with section 308 of the constitution, had been impeding his prosecution for alleged embezzlement of funds. “We are tired of immunity clause. Immunity has become impunity in Ekiti. We condemn Governor Fayose’s corrupt tendencies .Things must change. The EFCC must do its job and ensure that looters of Ekiti are brought to justice”, she said. A statement presented by the CNPP Chairman in the state, Mr Tunji Ogunlola, challenged Fayose to waive his immunity and face prosecution over his alleged involvement in N4.7 billion arms deal alongside former Minister of State for Defence, Musiliu Obanikoro and Peoples Democratic, PDP, governorship candidate in Osun State in the last poll, Mr Iyiola Omisore.